The Jungle Book is a collection of stories published in 1895 by British author Rudyard Kipling. The stories were first published in magazines in 1893–4. The original publications contain illustrations, some by the authors father. Set in the jungles of India The Jungle Book tells of a wolf-pack which lives and hunts in the forest. Led by the lone wolf Akela and the wisdom of the venerable bear Balloo, the pack stumbles across a baby human, a man-cub, they call him Mowgli. Raised by the pack and by the Law of the Jungle, Mowgli learns to live and fight using guile and determination instead of tooth and claw. With his friends Balloo and Bagheera, the black panther, Mowgli must confront the tiger Sher Khan, the tyrannical lord of the jungle, for the safety of the pack and to uphold the Law. 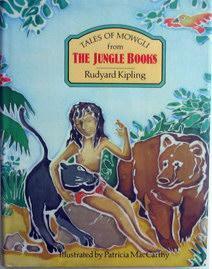 Although the stories of Mowgli are what most people think of when they hear of the Jungle Book, Mowgli's story is interspersed with other tales of the jungle, such as Rikki-Tikki-Tavi, a mongoose against the deadly Cobra, a tale of Kotick the White Seal on a search for a safe haven for his kind and the overheard conversation of camp animals by a British soldier who understands 'beast-talk'. Rudyard Kipling was born in India and spent the first six years of his childhood there. After about ten years in England, he went back to India and worked there for about six-and-half years. The Jungle Book was based on the author's view of India as well as his interpretation of the various folk-tales told to him by the Indian nurses of his childhood. To the general public, India was a land of exotic mystery, full of spice, magic and adventure. Kipling’s stories gave a glimpse of the magic land and served as an entertaining read for adults as well as moral parables for children. Because of it's moral tone The Jungle Book came to be used as a motivational book by the Cub Scouts, a junior element of the Scouting movement. This use of the book was approved by Kipling after a direct petition by Robert Baden-Powell, founder of the Scouting movement. Akela, the head wolf in The Jungle Book, has become a senior figure in the movement, the name being traditionally adopted by the leader of each Cub Scout pack. A number of movie adaptions of The Jungle Book, or parts of it, have been produced including live-action and animated versions. We have Tales of Mowgli from The Jungle Book and an abridged version of The Jungle Book in the fiction section of our library. We also have a large picture book of the Disney version in the Big Browsing Box. Upper Hutt Public Library has 4 copies of The Jungle Book by Rudyard Kipling in the Childrens section and 2 books of the Disney film adaption, as well as a copy of the DVD featuring the Disney movies The Jungle Book & The Jungle Book 2. The Jungle Book by Rudyard Kipling can be read online at Project Gutenburg and is available for download free at Project Gutenburg. Most of the above information was adapted from: here, here and here.